The snow has receded and the weather is warming. As the spring weather moves in, I wanted to keep everyone updated both on my work in Lansing and in the district. 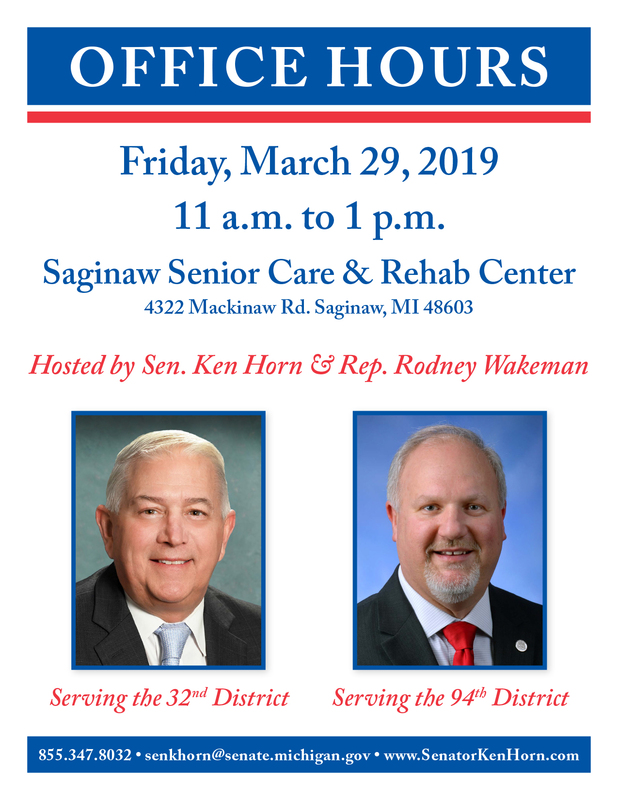 If you have any questions or concerns, please feel free to contact me at SenKHorn@senate.michigan.gov or toll-free at 855-347-8032. 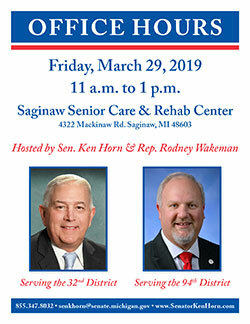 Or if you are in Lansing, please feel free to stop by my office, room 7100 in the Binsfeld Office Building. I recently had the pleasure of joining Rep. Vanessa Guerra at the 14th annual Books for Breakfast hosted by READ Association of Saginaw County. Books for Breakfast is a celebration of National Reading Month. The event featured a pancake breakfast, literacy activities, storytelling, costume characters, puppets and a free book for every child. For many years, I’ve also been lucky enough to be invited to the Read Across America Celebration at St. Charles Elementary School. I was happy to participate once again in the March is Reading Month activities at the school. I always look forward to reading to a classroom full of eager youngsters. Lt. Gov. Garlin Gilchrist came to Frankenmuth a couple of weeks ago. During his trip, he enjoyed a chicken dinner during a roundtable discussion about issues of importance with community leaders, including Rep. Rodney Wakeman and me. After the visit from the lieutenant governor, I met with 12 local teachers who are part of a legislative council. I meet with this group a few times a year to connect directly with teachers and discuss their needs in the classroom. The topics we discuss vary, but this time we chatted about teacher evaluation bills, snow day makeups, third grade reading and much more! Family pets can be caught up in domestic violence situations. Some abusers may injure or kill an animal as a way to abuse a victim of domestic violence or keep the victim from leaving. A new law effective this month addresses this kind of animal cruelty. Public Acts 452 and 652 of 2018 make it a crime and establish stiff penalties for someone to kill or torture the companion animal of another person. Animal abusers should face strong consequences when harming animals to intimidate people. More than 3,000 people in Michigan are waiting for an organ transplant. Oftentimes, the transplant helps save a person’s life. 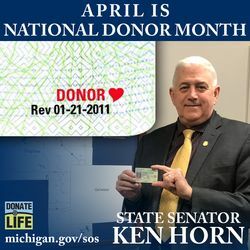 Next month is Donate Life Month and a good time to learn about organ donation. Just one donor can save the lives of eight people and improve the lives of even more. Motorists can purchase a Donate Life specialty license plate to support and help promote the need for organ, tissue and eye donors. The fundraising plates can be ordered online at www.michigan.gov/sos or at any secretary of state branch office. 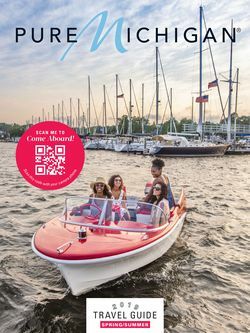 The 2019 Pure Michigan Spring/Summer Travel Guide features lighthouses, tiny towns, national forests and Great Lakes shore experiences as well as craft beer, casino and urban destinations. The publication also includes a seasonal calendar of festival events. Please call my office for a print copy or find the digital version at www.michigan.org.